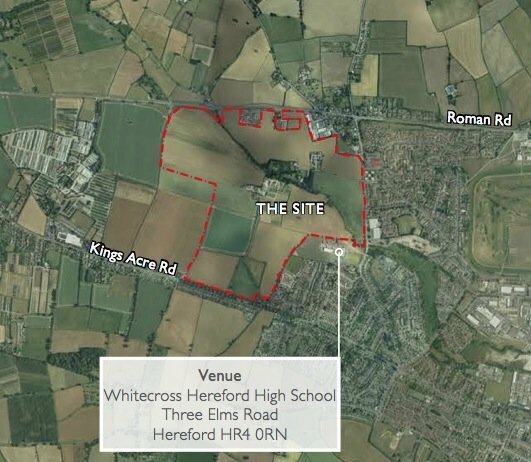 The Church Commissioners for England invite you to the Land at Three Elms Community Planning Weekend to inform the drawing up of an illustrative masterplan for a sustainable new neighbourhood to the west of Hereford. Land at Three Elms has been identified in Herefordshire Councilâ€™s draft Local Plan as a location for a mixed use development to the west of the city. The Council has identified the land for around 1000 new homes, 10 hectares of employment land, new open space and recreation areas, which will form a sustainable new neighbourhood. This development can also help to bring long term investment into the city, including the delivery of new infrastructure. John Thompson & Partners, architects and community planners, has been appointed by the Church Commissioners for England to work with the local community to inform and influence the development of an illustrative masterplan for the land. The Community Planning Weekend will be an opportunity to share local knowledge and contribute to planning the new neighbourhood through workshops and hands-on planning groups. There will also be an exhibition explaining the background of the site. For more information on the programme, please see the attached flyer. Please share this event with your networks, everyone is welcome! Following the Community Planning Weekend, the design team will move forward to prepare an Outline Planning application for the site, which it is anticipated will be submitted to Herefordshire Council in early autumn 2015. I look forward to seeing you at the Weekend. In the meantime, if you would like any more information please contact me at on 020 7017 1780. I think they have their West's (of Hereford) a bit mixed up I would say it is more east of Hereford. All we need now is the Catholics to have a go at something in Hereford and we will have the full set of religious input for the county. Definitely West, Denise.... this is just up the road from me. Isn't this the plan to build on the Huntingdon Lane fields??? The proposal would see a sort of infill of housing between Three Elms, Kings Acre and the new cattle market? And aren't they also saying there will be some sort of Park and Ride..... but without a park and ride lane???? The Yazor brook runs through these fields, before going under Three Elms Road and carrying on down the Ash Path, all the way down to the back of Bulmers, and then towards the city. I'm west of Hereford and think of Kingstone as the other side of town. Apologies for doubting their integrity! 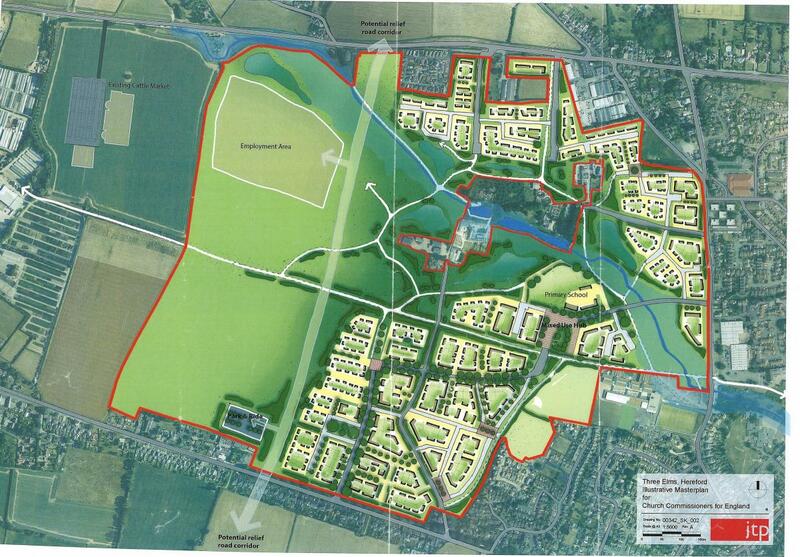 Dippy is correct, this is about the plan to build housing on a large area of fields just west of Whitecross School. 1000 houses sounds an awful lot. It is west AND north of the school - it is a MASSIVE area! This is a very worrying proposition. It's going to be "fun" if it goes ahead, that's for sure. Part of this land is graded Flood Zone 3 by the Enviromental Agency . Means not a lot to me but there must be a reason / evidence for this grading . Having said that I am sure that the Builders / Planners will take this into consideration.........? As Whitecross is a PFI school the Council is committed to a minimum number of students per year group- seems they are keen to make sure numbers don't fall. Whitecross is a PFI school - a fiscally ruinous scheme for the Council, where our highly paid (to get the best) officers did not formally address within the project the inflation risk ie they forgot to factor it in. An increase as low as 1% a year will cost us an extra Â£7.5m over the PFI contract period, on top of the Â£75m of regular payments. The former school site has yet to be sold to release some limited funds. None of this will bias the decision making in any way. Is it any wonder we are Â£200m+ in debt? Hi Ubique, I think a lot of the flooding issues stem from the brook, I mentioned in my earlier post. Some alleviation work has taken place..... but it still gets pretty soggy around there! Whitecross is a bit of an oddity now. When it was built, there was much talk of the building being as much used by the community as by the students. I seem to recall reading quite recently, that various uses of the school in the evening, were to be curtailed to reduce overheads. Dippy is right, despite the flood alleviation scheme upstream Yazor Brook does still flood, - and these fields in the plan also absorb some water flowing down to Kings Acre Road from Breinton Ridge (as in floods of February 2014). Don't forget this opportunity to ask lots of questions about building 1000 houses at Three Elms, either side of Huntington Lane. 1. How did a Church come to own this land ? 2. How much are the possible house builders paying to the church if Planning Permission is granted ? 3 . What will the church do with the 6 / 7 figure sum they will receive from the house builders ? Just tried to email the Consulantants to ask the same questions - entry refused to HV ! It is the Church Commissioners rather than the 'Church'. 1. Goes back centuries - accept that they have title to it and move on. 2. Not really open to disclosure I imagine - no different to any private land sale/deal. Better to ask - how much will the Section 106 obligation monies be and what will the council do with them? I am surprised it is a public event held in a secondary school. Can people just walk in as I thought schools didn't allow this sort of thing? I don't know why there needs to be lots of cars and car parking as this site is so flat (because it is a flood plain?) that a lot of children and people in the area walk and cycle. However, isn't this site smack in the middle of the Western Relief Road corridor? I have kindly bee provided with this map. Please find attached the image of the Western Relief Road corridor in the Councilâ€™s Core Strategy plan as it shows that the corridor covers most of the 3 Elms housing plan to be held at the community planning event. I have copied the image from the full Core Strategy document which is on page 53 of this document https://www.herefordshire.gov.uk/media/7848349/pre-submission_publication.pdf . Bear in mind this map was made in 2010 so ideas have probably changed. And what is the significance of the Hereford and Gloucester canal route drawn on the map into the centre of Hereford? Water taxis?!! I had a very short conversation last Saturday with Len Tawn and Charles Nicholls about this proposal. I was re-assured that unless there were proper plans in place for sewage, flood alleviation and traffic then it would be fought. Also mentioned was the new Industrial Estate(shown on Colin's map). This is supposedly to provide employment for all the people moving into the 1000 houses! The general consensus in Bobblestock(at the bar @ the Elms), is only provide the housing if the employment demands it, not the other way round! I feel strongly about this development. Walking down Huntington Lane with my daughter to feed the ducks is a pleasure because of the hedgerows and fields. Also the beautiful view you get of Huntington Court and the pool. All will be lost. There appears to be an employment site on this illustrative master plan with the potential relief road corridor indicated. From the map kindly provided by megilleland does this mean that the Church Commissioners or their planners decide the route of the Western Relief Road? They seem to have decided which homes are to be demolished on Kings Acre road but I expect like Jean Harris the owners might know nothing about this poor souls! "Public consultation" starts this afternoon, folks. I'll be there later, making "suggestions" if possible! I believe that at least half of these houses are reliant on the western bypass which is of course reliant on the southern link road, hence why the current council is pushing hard for the SLR. I went yesterday evening and it seems that the Western relief road could be a big problem for this development as the Council will need lots of the developers money. The number of houses to be built is apparently a minimum of 1,000 and yes quite a bit is in a flood risk area. I am going again today to see if the planning debate will listen to what local people have to say - I would love to see some good quality, low energy homes for young people/families mixed with good homes/accommodation for older people. If this can be done elsewhere why not here? If we don't try we will just keep getting rabbit hutch accommodation of low quality that is likely to come with a ground floor swimming pool in wet weather! The old railway line runs through the site and this could be a great cycle route/footpath - years ago the line used to run all the way out to Moorhampton and beyond, a lovely area of the County, especially in blossom time! You are quite right James when you say at least half these houses are reliant on the Western Relief Road. I went to a Civic Society meeting and it was said there that payment will be made when they have started the Relief Road and a further payment when it is completed. The literature on the transport by the Thompson people states that the Western Relief Road will have shared wide footpaths and cycle ways. The display boards shown at the event can be seen here http://jtp.co.uk/public/uploads/pdfs/land_at_three_elms_exhibition_boards.pdf . This is a bit different from the Southern Link Road which has no footpaths or cycleways along its length. The Rotherwas access road has no footpaths or cycleways along it, despite it being a relatively new road. I dont understand why the Council dont want walking and cycling in that area as there is a great national cycle trail which goes along the Great Western Way and out beyond Grafton - great place to take the kids for a bike ride away from the cars and build their confidence on a Bank Holiday weekend! At Three Elms the access to the development is to be in 3 places - Kings Acre Road, 3 Elms Road and off the Roman Road via T junctions and makes no mention of access from the Relief Road. At the planning event we were told that as the "relief road" is supposed to be a major route it cant be a housing estate road as there would be too many junctions in and out of the housing. A "Community Planning Weekend" sounds very caring, doesn't it? So the developers can say they have "consulted" the community. But it will be interesting to see if they do take any notice of local concerns. They don't live in the area themeselves, so up to now they have only had info available on the internet. They don't know that some of the maps they show are really misleading. Take flood risk. Their maps don't show surface water flooding risk, only risk from Yazor Brook. They don't know how badly the fields around Whitecross School and near Kings Acre Road were flooded in Feb 2014. Fayre Oaks Home Park across the road flooded very badly then and had to have a fire engine and pumps for several days. 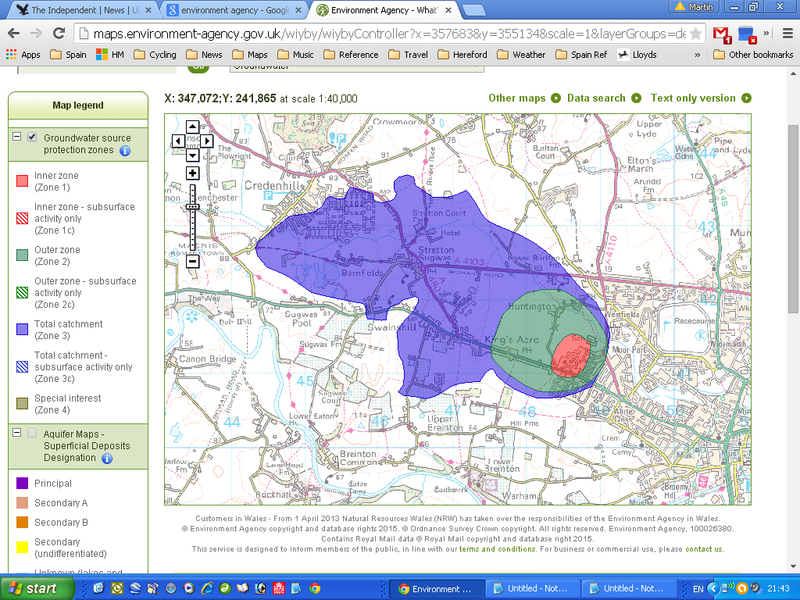 Does this map from the Environment Agency have a bearing on what can be built in this area? What are Groundwater Source Protection Zones? Groundwater provides a third of our drinking water in England and Wales, and it also maintains the flow in many of our rivers. In some areas of Southern England, groundwater supplies up to 80% of the drinking water that you get through your taps. It is crucial that we look after these sources and ensure that your water is completely safe to drink. We have defined Source Protection Zones (SPZs) for 2000 groundwater sources such as wells, boreholes and springs used for public drinking water supply. These zones show the risk of contamination from any activities that might cause pollution in the area. The closer the activity, the greater the risk. The maps show three main zones (inner, outer and total catchment) and a fourth zone of special interest, which we occasionally apply, to a groundwater source. We use the zones in conjunction with our Groundwater Protection Policy to set up pollution prevention measures in areas which are at a higher risk, and to monitor the activities of potential polluters nearby.